Daddy surprised us with a road trip to Weber Orchard. Ryan and Mikey loved looking at and touching all of the goods harvested locally! Ryan and Mikey picked out pumpkins. Ryan was trying to tell us that the pumpkins were orange. Mikey loves to look at Indian corn, as he is amazed at how many different colors each cob can be. The gift shop had dinosaur puppets! The boys helped Mike select 4 different varieties of apples, way more than we indented to buy, but they had so much fun selecting them! Mikey and Ryan, wanted to see how tall they were before we headed home! *Thanks Daddy for taking us to the orchard, it wasn't your fault that the orchard was picked clean the weekend before! Who knew that it was Johnny Appleseed's birthday, and everyone in the state would come to this orchard? The boys and I had fun any way! Thanks for trying to surprise us! Mikey was so excited to be building a fire truck, that he talked about it all week! Before we left the house he asked if Grandpa knew we were making a fire truck, as he would be very proud! Mikey has gotten so much better at driving nails in with the hammer! The Rookie hit 2 nails, and helped to put the stickers on his fire truck! Ryan and Mikey couldn't wait to play with their fire trucks, as they had sirens! On our way to New York, we stopped by Jersey City, NJ to show Mikey where he lived and the hospital where he was born. The one thing we really miss, is the amazing view at Fisk park, which was right across the street from our apartment! On your far right is the new tower being built, Mikey was shocked he could see it all the way in New Jersey. Jenny, Ryan, and Mikey; with the Empire State building behind us! Even the Holland Tunnel paid tribute to 9-11! We stopped to watch the Marine Corps Band, play patriotic music; it was very moving! We then went to the M & M Store! Mikey and Ryan almost couldn't contain their excitement, they didn't know that M &M's came in so many colors! Mikey and Ryan with the M&M Lady Liberties! The new Father Duffy Memorial in Times Square. Jenny, Mikey and Ryan in the heart of Times Square! I loved that the 9-11 tributes were every where, even inches away from the New Years Eve count down ball, in the center of Times Square! We stopped at watched the live feed on the big screen, of the new 9-11 Memorial at Ground Zero. Only family and those with special passes were allowed any where near the site today. Love, love, love all of the signs advertising the shows currently on Broadway! The Disney Store in Times Square is HUGE! Wouldn't be a visit to the heart of NY, without seeing the Naked Cowboy. This is not the original; he was there, but all I saw was his backside. There is now a booming "Naked Cowboy" business as we saw 3 cowboys and a cowgirl. It was too funny, to watch Mikey's reaction! Ryan and Mikey, near the recruiting station, looking at all of the lights. We stopped to make a wish at this fountain, and play in the water. The flags at half staff at Rockefeller Center, were the last thing we saw, and it was a great way to honor those we lost. The flags slowly moved, and the size and visible sign of honor, was just a sight to behold! We debated if Ryan was ready for Build and Grow, and thought that we would try a class with both boys just to see how it worked out. When they posted that the project was a police car, with flashing light...two little boys were very excited to go to Lowes! Ryan the "Rookie" and his new red apron, he has some growing to do! Unfortunately, this is how Ryan spent most of the class...with his hands over his ears, as the hammering sounds were too loud for him. The Pro vs. The Rookie, lets call it a draw! Both boys did great, and couldn't wait to show off their completed police cars! 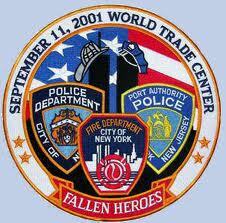 Words can not express the great loss that happened on 9-11-01. We lost 2,996 American heroes that morning, when 4 planes were flown into the Tower One, Tower Two at the World Trade Center, the Pentagon, and at Shanksville, PA. I had only been at work for a few minutes, waiting for the bank to open, when the phone at my desk rang. It was Mike, calling to tell me that a plane had flown into Tower One. I remember trying to rush Mike off of the phone, so I could unlock the doors to the bank, and start my busy day. He stopped me and said "Jen, did you hear what I said? A plane was flown into the World Trade Center, you need to get to a TV." I stopped and said, " Oh, my God, I'm sorry I didn't catch what you said the first time. Let me call you back." I remember running down the steps to our break room, getting the attention of our bank manager and telling her I was taking the television upstairs, as something horrible had just taken place in New York. She helped me load the TV into the money elevator, and the two of us, dragged the TV into the bank lobby. We quickly turned on the TV, to watch in horror as the second plane hit. I distinctly remember saying, "Why, why would someone do this? The tears streamed down my face, and I just sat there in shock. The lobby opened, and we all were still gathered around the TV. Customers joined as, and no one spoke...it was silent. When news broke of the the attack at the Pentagon, we received word that the bank was under a security watch, and it would close immediately. We locked the doors, and all of us gathered around the television set to watch the events unfold. We all stood in shock and awe as Tower One and Two later collapsed. Local St. Louis television talked of the shutting down of the airport, major buildings in the City of St. Louis were evacuated, National parks and government buildings shut down, but my great concern was for my father and father-in-law. As the daughter of a fireman, and the daughter in law of a St. Louis Police Officer, I was terrified that something would happen locally, and not just in New York, D.C., and Pennsylvania. I will never forget trying to call my Dad, as I knew he was working that day...the phone lines were jammed! I couldn't get a hold of my Dad, and I was terrified! Mike was able to get a hold of his Dad, fairly quickly, but he had been dispatched to guard the down town federal building, as they were on high alert. Many hours later I spoke with my Dad, and I felt so much better knowing he was safe. I can not express how humbling it is to think that if the location was different, it could have been my father or father-in-law, in the Towers. In the days that followed my Dad bought us all t-shirts to support the 343...the number of firemen that lost their lives in the rescue efforts on 9/11. I am beyond speechless, at the great sacrifice of these men and women. In September of 2006, Mike and I went to New York and Ground Zero. I was shocked at what I saw, the mementos and pictures hanging on the fence knocked the air out of my lungs, 5 years after the fact. I cried just as much as I did, when it happened. I cried when I saw that there was a picture of a young man, wearing a STL Cardinal's sweat shirt. (This didn't just impact people from New York!) I couldn't form words, and Mike just nodded and held me. I said a prayer and just stood there, watching the workers at Ground Zero. To say that there was silence and activity, at the same time is confusing...but it was. One side on the fence was reverent, and honoring the thousands, and on the other side was new life and moving forward...very hard to explain. We had the honor of visiting the fire house located at the World Trade Center, still an active fire house today, which has opened one of its truck bays, to honor the two crews lost on 9-11. 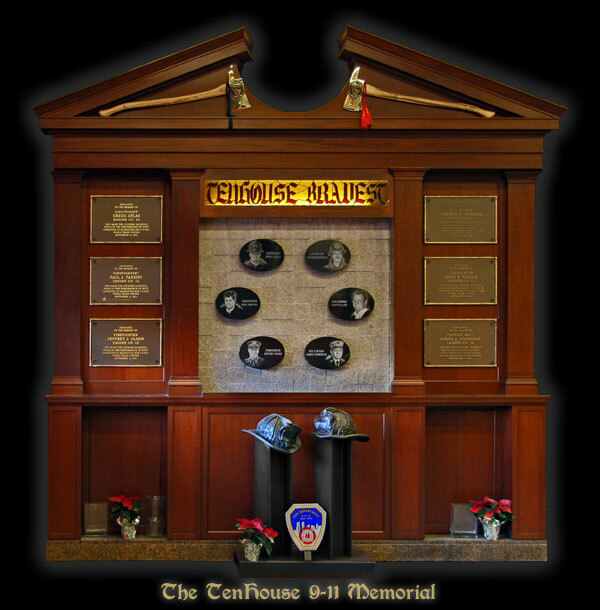 When you approach the fire house you see a beautiful bronze wall, listing the names of the 343 fire fighters who perished. Mike and I just took a moment to bask in the beauty of it as the sunlight reflected from it's surface. We then walked around the corner to see the memorial for ladder and engine #10 crew. I cried even harder, with the thoughts of my Dad, and the fact that an entire fire house crew was lost on that day. Humble doesn't even define what I felt at that moment. Mike then drove to the New Jersey side of the river so that we could get a view of the towers of light memorial. 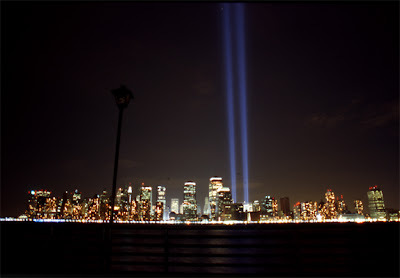 The skyline was stunning, and the two beams of light were breath taking! I will never forget the view. Honest, and hard working Americans arrived to work, and the 2,996 Americans who gave the ultimate sacrifice, will never be forgotten, and their legacy will live on forever! A simple phrase, but one that our local police and fire departments need to hear. Without reservation, our local men and women protect us daily, and I find comfort in that. Knowing that men and women, continue to defend our Nation in the Armed Services, while I sleep in a warm bed...thank you doesn't seem like enough. I pray that God will continue to watch over all of these men and women, who serve! Our family has been watching "Rising: Rebuilding Ground Zero," series on the Discovery Channel. I am amazed that Mikey understands what he is watching, and has told us that many people died and even a fire truck was crushed. Even a 4 year old understands the events that unfolded on 9-11. 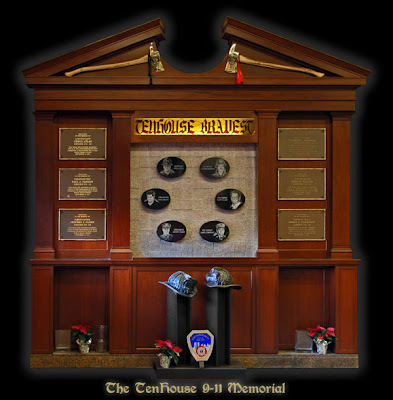 We hope to take the boys to the new 9-11 Memorial in the coming days, once it opens to the public. 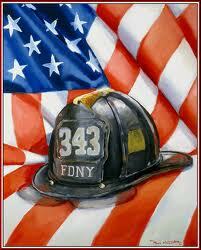 I know that our family will honor the memory of those who unwillingly gave their lives, on that day. How will you honor and remember 9-11-01 in your homes and hearts? We dodged the rain drops, and went to the Maryland State Fair, on Labor Day. Mikey and Ryan, couldn't wait to visit the barns filled with baby animals. Brodus, the hog, weighed in at a whopping 1001 pounds, and was on the Today Show. Mikey saw the pedal tractors and made a bee line for the blue one! Ryan was excited that they had one his size! Ryan and Mikey, were so happy to both win plastic hammers that squeak! Mikey and Ryan found a "huge" tractor! So when the boys were old enough, Grandma showed them the snack bucket, and let them pick out their very own treats. It soon became a running joke, go to Grandma's house, go see what the latest treat was in the snack bucket. As the boys grew, they knew that if they asked permission, batted their eye lashes, and it wasn't dinner time, Grandma would let them have fruit snacks or cheese its. Wait...back up...you encourage salty and sugary snacks? Are you crazy? That's unhealthy! You are setting a horrible foundation for eating healthy! Yes, I agree the idea is horrible! I was not 100% on board, but I was desperate! I had offered him many, many things, and he vetoed all of my bribes to pitch the diapers. After Mike and I sat down, we agreed that if it worked, and Mikey took the bait, we could control what he would be snacking on. So, we potty trained like a champ, and are 100% diaper free. Yes, there have been marathon runs in a retail store to find a bathroom...yes, there have been a few oops, but I am proud to say our little man is all about being a big boy, and using the toilet. We giggled, when he soon tired of the potty, and told us "real big guys use the white, cold potty in the bathroom!" When Linda had surgery in June, and was exposed to a major infection, which shut down a few of her organs; she was crushed that she couldn't send Mikey his snack bucket. The woman spent a month in a coma, and she was worried about a plastic tub, filled with junk food...are you kidding me? (So the snack bucket idea, went on the back burner, while she healed and recovered in the hospital.) She called last week to let us know that it took a lot for her to go to drive to the bulk store, wrestle the box while using a cane, and drag the box inside the post office...but it was on its way! The snack bucket would arrive soon! Mikey saw the mail truck arrive, and watch from the window as Daddy brought the box inside. Daddy teased him by asking what he thought might be in the box. Do you think there is a puppy inside the box? Is it a box of crabs? Did someone send us books? Two very excited little boys, could not wait to rip into the box from Grandma and Papa! Mikey and Ryan with the mystery box! Is it a puppy or box of crabs? Might not look like much, but to see that Linda wrote this on the plastic container, is a huge deal! She had to learn how to use her right hand all over again. So, to see this was very exciting, for our family! *A huge thank you to Grandma, Papa, and Dylan; as we loved what you did for the boys! Thank you for sending us a huge (bigger then Dylan's) snack bucket! We love it! **If you disagree with this, sorry. It worked for us, it was a monumental feat for it to be mailed out, and we will only give the boys treats sparingly, under moderation.